For several hours we drove across the vast, western Iraqi desert on a virtually empty six lane highway toward the Mesopotamian valley that stretches between the Euphrates and Tigris rivers, on the banks of which lies Baghdad. My new friend talked incessantly about the injustice of the sanctions. He described the suffering of the Iraqi people, how the western media portrays all Iraqis as evil and how virtually everything is interpreted by the UN to have a double usage, that is both civilian and military, and thus prohibited under the embargo. He condemned the regular bombing of Iraqi territory by US and British warplanes ten years after the Iraqi military had retreated from Kuwait and how Iraqis are being punished by illnesses and death caused by the massive use of depleted uranium weapons against Iraq during Operation Desert Storm. He of course never mentioned Saddam Hussein or his role in the situation. 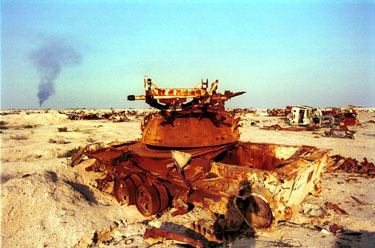 I was in Iraq to photograph the effects of the embargo, but more importantly to investigate and photograph the effects of depleted uranium on the Iraqi people ten years after the Gulf War. 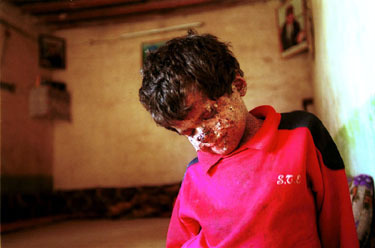 Depleted uranium is a mildly radioactive byproduct of enriched nuclear fuel production. Its high density makes it particularly effective for use in weapons designed to pierce armored vehicles and military installations in a theater of war. vaporizing into microscopic particles that can be inhaled, absorbed into the skin and dispersed in the environment. In this state they are believed to be highly toxic. There have been many reports of sharp increases in cancers, birth defects and mysterious illnesses amongst the Iraqi people since the war.